If you turn on iTunes Match on your iOS device, you lose the ability to create Genius playlists on same—the atomic icon just disappears. It’s very frustrating. Loath as I am to gently correct a person higher up the org chart, while I agree that it’s frustrating, it also makes sense. We’ll use my iTunes Match library as an example. Using the technique I outlined in Dealing With iTunes Match’s 25,000 Track Limit I was able to prune my iTunes music library to around 21,000 tracks. Those tracks are all in the cloud, available to my iOS devices provided that said devices are attached to a wireless network. Now let’s imagine for the moment that the Genius feature is available on my devices with iTunes Match switched on. I choose a track, tap Genius, and a Genius playlist is created (we’ll assume, in this case, that the device holds a database of tracks as well as Genius results, but, of course, not the tracks themselves). I start playing the playlist and it streams to my device. Deaf to that playlist’s requirements, I take a stroll and lose Internet connectivity. The stream and downloads stop. I curse. I’m not privy to how Apple evaluates features like iTunes Match, but I’m going to guess that those tasked with such evaluation believed that users would be more frustrated by Genius playlists that streamed slowly over a poor Internet connection (or not at when no connection was available) than by the feature missing from iOS devices altogether when iTunes Match was switched on. But because I’m keen on seeing at least one positive remark on next year’s employee evaluation, I can offer this suggestion: You can kinda/sorta use Genius and iTunes Match in tandem. That avenue is your Mac. Unlike with iOS devices, Genius works with a Mac’s or Windows PC’s iTunes library when iTunes Match is enabled. Start by turning off iTunes Match on your iOS device. Then, just as you normally would, select a track in your iTunes library on your Mac, click the Genius button in iTunes’ bottom-right corner, and wait for iTunes to create the Genius playlist. Click the Save Playlist button at the top of the playlist pane. It will appear under the Genius heading in iTunes’ Source list. If the tracks are only in the cloud and not in your iTunes library, the playlist will have a Download icon next to it. If you see that icon, click on it and the playlist's tracks will download to your computer. Sync that playlist to your iOS device. (Note, you must download those tracks to your computer first if they're not in your iTunes library. 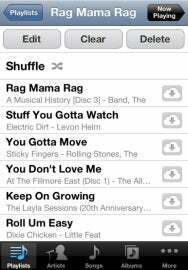 Although you can sync a Genius playlist of tracks that live only in the cloud to your iPhone, iPod touch, or iPad, that playlist will be empty on the iOS device. More on this in a bit.) You now have Genius-created playlists on your device, though you gave birth to them on your computer. When you have an Internet connection and want access to your iTunes Match library, just go to the Music setting and switch on iTunes Match. (To see all of the music on your device—iTunes Match as well as synced music—make sure Show All Music is also enabled.) The Music app will eventually show you the contents of your iTunes Match library, ready to stream and download. Now here’s a little something that, I hope, makes me eligible for my holiday bonus: You created a few Genius playlists on your Mac and synced them to your iOS device without downloading them from iCloud first (or with them in your iTunes library). With iTunes Match turned off on the device, those playlists are empty. But turn iTunes Match on and the playlists are fully populated with the contents of that Genius playlist you created. They’re no longer Genius playlists but rather standard playlists. Note that each track has a Download icon next to it. You can now download individual tracks by tapping on these icons, or download the entire playlist by scrolling down to the bottom of the screen and tapping Download All. You have a couple of options when you venture out into a world devoid of Internet access. You can leave iTunes Match switched on provided that Show All Music is also enabled. You won’t be able to access your cloud-based music, but you can still play the music you’ve synced and downloaded. Or you can switch iTunes Match off. Do so and your iCloud music will eventually disappear from the device, leaving only your synced and downloaded tracks.